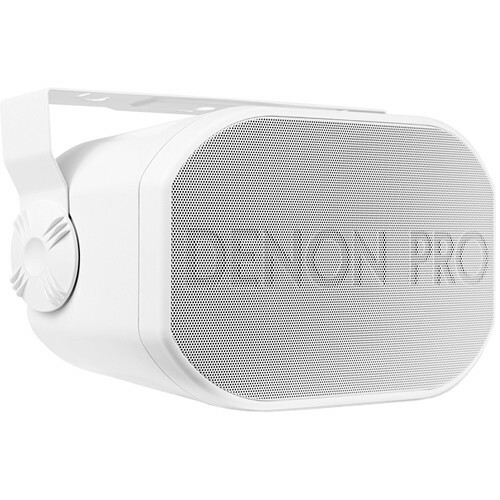 The white Denon DN-205IO is a 6.5" 2-way passive speaker made for installation in a variety of indoor and outdoor environments such as restaurants, clubs, gyms, pools, and more. The weather-resistant design incorporates a cabinet and grille coated in a paintable white finish. The included angle-adjustable mounting bracket allows horizontal or vertical mounting, making the DN-205IO easy to position. The 6.5" woofer and 1" tweeter deliver a frequency response of 60 Hz to 20 kHz while handling up to 50W of RMS power. A rear-panel switch enables easy selection of the transformer taps, which support operation with 70V, 100V, or 8-Ohm systems. The dual binding post screw terminal input ensures simple and securing wiring to your power amplifier or powered mixer.